Oh, DC, this is very silly. The good news first: a new comic anthology series coming from the company brings back some minor DC heroes and, re-pairs some of them with their original creative talents. The bad news? Said anthology is named Legends of Tomorrow, despite having nothing to do with the TV show. Let’s talk about the cool bit first. 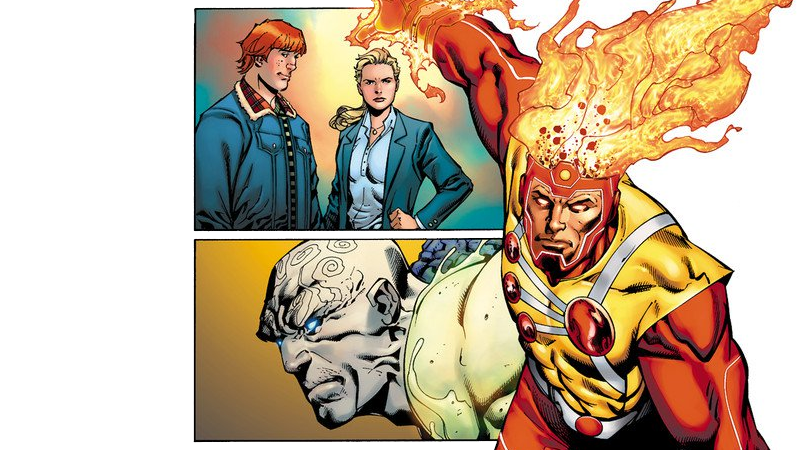 The new anthology series will host stories based around Firestorm, Metamorpho, the Metal Men, and a reboot of the 1950s kids characters Sugar and Spike that reimagines them as modern day P.I’s in the DC universe cleaning up the problems of major superheroes—all characters that haven’t exactly had the most deserving swing at the bat lately. Even better, in Firestorm’s case, he’s being reunited with his original creator, writer Gerry Conway—mere months after the writer was engaged in a spat with DC over royalties paid to comics creatives. Sugar and Spike will be written by Keith Giffen, Bilquis Evely on art. Metamorpho will be written by Aaron Lopresti with art by Lopresti and Matt Banning, Metal Men will be written by Len Wein, with art from Yildiray Cinar and Trevor Scott, while Eduardo Pansica and Rob Hunter will provide art for Firestorm. All this sounds very good, and an interesting way to bring together characters who would probably never be able to hold up their own ongoing series or miniseries these days. ... and then some bright spark decides to call it Legends of Tomorrow. Because #branding, I guess? Presumably, the reason it’s called Legends of Tomorrow is so people watching Legends of Tomorrow who don’t otherwise read comics see the name on a book shelf somewhere, get intrigued, and pick up an issue. But here’s the problem with that: the moment they get past the front cover, they’re going to be incredibly confused that this series—a really good-sounding series, I must reiterate!—has nothing to do with the group of heroes they enjoy watching on TV, outside of the presence of Firestorm. If someone who likes Legends of Tomorrow wants to read a Legends of Tomorrow comic, they’re going to want something that’s at least vaguely similar to what they’re familiar with. They want the characters or the general scenario... not just literally the name slapped on for shits and giggles. It’s the laziest attempt to grab attention from the explosively popular realm of live-action superhero adaptations I’ve seen in a long time—which is a damn shame, considering the anthology itself seems like an interesting idea. Why give it such a pointless title? Legends of Tomorrow will be out in March, to capitalize on the then-ongoing premiere of the Legends of Tomorrow TV show’s first season... for no particular reason whatsoever.